Close Out Special!! 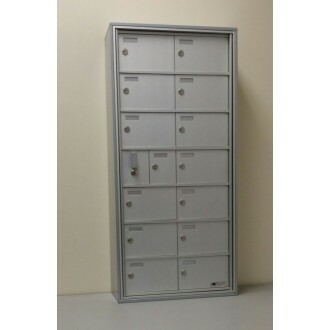 14 Door Surface Mount Front Loading Small Item Cabinet (5"H x 8"H doors, 6-1/2"D) FREE SHIPPING !! Hurry 1 left! Close Out, 14 Door Surface Mount Front Loading Small Item Cabinet. Short depth security cabinet is perfect for cell phones, pagers, wallets and other smaller items that need to be secured. Please Note: This cabinet is a close out, has minor scratches on one side and top. One left!! FREE SHIPPING!! 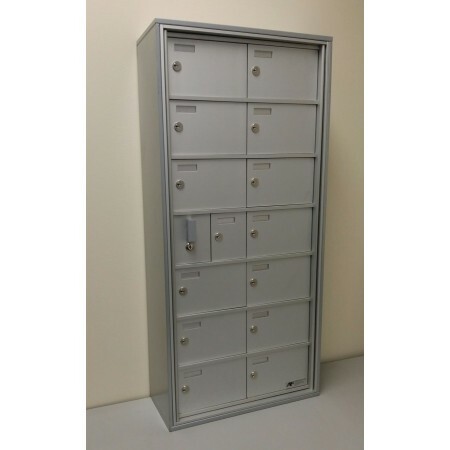 • Mailbox modules are constructed of heavy-gauge aluminum for years of service. • 5 Pin cam locks included with 2 keys per door. Note: On this front-loading unit you lose one door to a Master door. A master door will then open entire front of cluster. 14 Doors: Thirteen - 8"W x 5"H item doors and One 5"H x 4"W item door (6.5" Inside Depth) (14 Useable doors and 1 master door that opens up entire front of box). Note: No returns, this is a close out special.